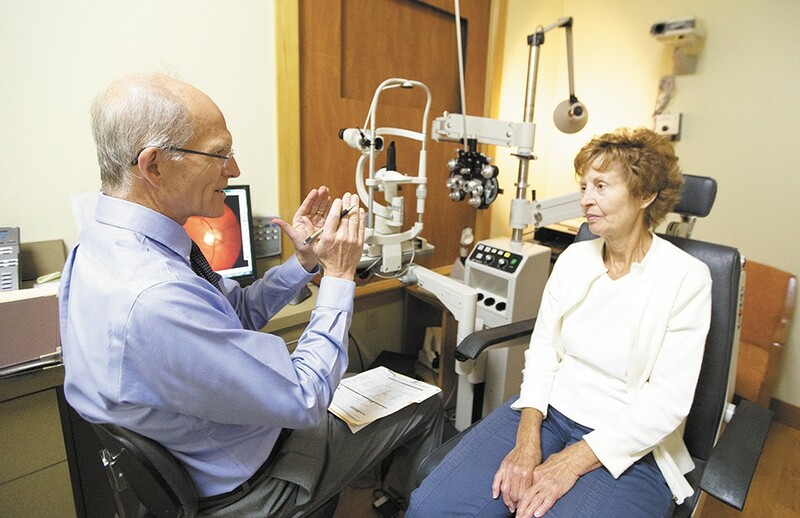 Arlene Bennett listens as Optometrist Todd Wylie explains the results of her eye exam. Sometimes it's barely recognizable. Words on the page of your favorite book seem out of focus, and street signs appear farther away. Sometimes it's inhibiting. Pill bottles, odometers and recipes become impossible to read. Although serious eye diseases require expert intervention, apps and software are helping people cope with, and sometimes even combat, decreased vision that comes with aging. Smart phone apps and tablets offer the ability to magnify fonts and transcribe audio into text. And new apps offer visual "exercise" programs that may help retrain aging eyes — or more accurately, the brain's ability to work with information from the eyes. The UltimEyes app, available for $10, is designed to help users optimize their visual processing, including near and far vision and the ability to better discern low-contrast images. It touts research showing some users could read two additional lines on eye charts after eight weeks of training. The GlassesOff app, with a list price of $60 (though discounts are offered), aims to improve near vision — "Free yourself from dependency on reading glasses!" — by enhancing the image processing function in the visual cortex of the brain through game-like challenges over a three-month period. "The technological revolution, particularly for iPads and tablets, has been helpful for people with vision loss," Ophthalmologist Alison Granier of the North Idaho Eye Institute says. "I have a lot of patients that feel like they are more functional because of these apps." Other apps are more simplistic. Eye Health Saver reminds users to save their vision by taking frequent breaks while reading, playing games or being online. The SightBook Application allows users to take a series of visual tests and share the results with their physicians to schedule appointments and monitor progress. While vision apps might help some patients cope with minor eye issues, aging can also bring more serious problems. "Cataracts, the risk of glaucoma, and the risk of macular degeneration are the primary causes of vision loss for the elderly," says Granier. Glaucoma is a "silent disease" that causes slowly progressive vision loss and usually goes unnoticed in its early stages, as it initially affects peripheral vision. Despite the legalization of marijuana, Granier says the drug's publicized benefit for glaucoma sufferers may have been over-hyped. "[Marijuana] has been used in the past for treatment because it may have a very slight inter-ocular pressure lowering effect," she says. "But the effect is so slight that it's not commonly prescribed... For very advanced stages of glaucoma, with people who are having trouble with pain control, we might use it... as it will also give pain relief." While glaucoma is genetically-linked, "Cataracts are an inevitable part of aging," Granier says. A cataract is a progressive clouding of the lens in the eye. "I think patients hear the word cataracts and think tumor or something fearful, but surgery [to treat cataracts] has improved in the last 10 to 20 years, and it's not something to be afraid of." Eyes can also reflect just how healthy the rest of the body is. The most common causes of blindness are macular degeneration and diabetic retinopathy. Macular degeneration results in vision loss in the center of the visual field. "The macula has the highest metabolic need of any tissue in our body," says Optometrist Todd Wylie, owner of Advanced Eyecare & Optical. "That's the number one spot in our body that needs maximum nutrients, oxygen and blood flow to remove waste." Wylie encourages his patients to eat nutrient-rich diets of fruits, vegetables, leafy greens and fish. The less processed, the better. Although eye dryness is common with age, drinking up to three ounces of water every hour depending on body weight is recommended for proper hydration. He also encourages patients to incorporate high-intensity interval training into their exercise routines to increase overall metabolic benefits to the body. "We are seeing people in their 50s with cataracts, and that's a relatively recent occurrence," Wylie says. "It's due to poor general health. The eye is much more metabolically involved than we think." Wylie says he's also seeing an increased number of people with diabetes and resultant diabetic retinopathy — a result of changes in blood vessels of the retina. In some people with diabetic retinopathy, blood vessels swell and leak fluid. In others, abnormal new blood vessels grow on the surface of the retina.